Romero, L., Siegel, D.A., McWilliams, J.C., Uchiyama, Y. and Jones, C. (2016): Characterizing stormwater dispersal and dilution from small coastal streams, J. Geophys. Res. Oceans, Vol. 121, doi:10.1002/2015JC011323. Marchesiello, P., Benshila, R., Almar, R., Uchiyama, Y., McWilliams, J. and Shchepetkin, A. (2015): On tridimensional rip current modeling, Ocean Modell., Vol. 96:1, pp. 36–48, doi:10.1016/j.ocemod.2015.07.003. Kumar, N., Feddersen, F., Uchiyama, Y., McWilliams, J. and O'Reilly, W. (2015): Mid-shelf to surf zone coupled ROMS-SWAN model-data comparison of waves, currents, and temperature: Diagnosis of subtidal forcings and response, J. Phys. Oceanogr., Vol. 45, pp.1464–1490. doi: http://dx.doi.org/10.1175/JPO-D-14-0151.1. Romero, L., Uchiyama, Y., Ohlmann, C., McWilliams, J.C. and Siegel, D.A. (2013): Particle-pair dispersion in the Southern California coastal zone, J. Phys. Oceanogr., Vol. 43, pp.1862–1879, doi: 10.1175/JPO-D-13-011.1. Weir, B., Uchiyama, Y., Lane, E.M., Restrepo, J.M. and McWilliams, J.C. (2011): A vortex-force analysis of the interaction of rip currents and gravity waves, J. Geophys. Res., Vol. 116, C05001, doi:10.1029/2010JC006232 . Uchiyama, Y., McWilliams, J.C. and Shchepetkin, A.F. (2010): Wave-current interaction in an oceanic circulation model with a vortex force formalism: Application to the surf zone, Ocean Modelling, Vol. 34:1-2, pp.16-35, doi:10.1016/j.ocemod.2010.04.002. Dong, C., Mavor, T., Nencioli, F., Jiang, S., Uchiyama, Y., McWilliams, J.C., Dickey, T., Ondrusek, M., Zhang, H. and Clark, D.K. (2009): An oceanic cyclonic eddy on the lee side of Lanai Island, Hawai'i, J. Geophys. Res., Vol. 114, C10008, doi:10.1029/2009JC005346. Uchiyama, Y., McWilliams, J.C. and Restrepo, J.M. (2009): Wave-current interaction in nearshore shear instability analyzed with a vortex-force formalism, J. Geophys. Res., Vol. 114, C06021, doi:10.1029/2008JC005135. Uchiyama, Y. (2007): Hydrodynamics and associated morphological variations on an estuarine intertidal sand-flat, J. Coastal Res., Vol. 23, No.4, pp. 1015-1027, doi:10.2112/04-0336.1. Kuwae, T., Kamio, K., Inoue, T., Miyoshi, E., and Uchiyama, Y. (2006): Oxygen exchange flux between sediment and water in an intertidal sandflat, measured in situ by the eddy-correlation method., Mar. Ecol. Progr. Ser., Vol. 307, pp.59-68, doi:10.3354/meps307059. Kuriyama, Y., Uchiyama, Y., Nakamura, S. and Nagae, T. (2003): Medium-term bathymetric change around jetties at Imagireguchi Inlet, Japan, J. Coastal Res., Special Issue 33, Functioning and Design of Coastal Groins: The Interaction of Groins and the Beach—Process and Planning (winter 2004), pp.223-236. Uchiyama, Y., Nadaoka, K., Rolke, P., Adachi, K. and Yagi, H. (2000): Submarine groundwater discharge into the sea and associated nutrient transport in a sandy beach, Water Resour. Res., Vol.36, No.6, pp.1467-1479, doi:10.1029/2000WR900029. 内山雄介（著）・内山久雄（監修） (2013): ゼロから学ぶ土木の基本 水理学, オーム社, 224 pp., ISBN 978-4-274-21320-5. 岡田信瑛・内山雄介（2019）：和歌山県田辺湾における海水交換特性の季節変化とその形成メカニズムに関する研究，瀬戸内海，（公社）瀬戸内海環境保全協会，Vol. 77, pp. 50–51, 2019年3月. Takatama, K., Kurosawa, K., Uchiyama, Y. and Miyoshi, T. (2019): A preliminary analysis of a newly-developed regional ocean data assimilation system: A case of Tokyo Bay in summer, 7th International Symposium on Data Assimilation (ISDA2019), Jan. 21-24, 2019, Riken RCCS, Kobe, Japan. Cao, Y., Dong, C., Uchiyama, Y., Wang, J. and Yin, X. (2018): Multiple-scale variations of wind-generated wave in the Southern California Bight, 20th Pacific Asian Marginal Seas (PAMS 2019), Mar. 19-22, 2019, Kaohsiung, Taiwan. Takaura, N., Uchiyama, Y., Zafarullah, N. and Nakayama, A. (2019): A medium-term reanalysis of synoptic circulations in the South China Sea using a HYCOM-ROMS downscaling ocean model, 20th Pacific Asian Marginal Seas (PAMS 2019), Mar. 19-22, 2019, Kaohsiung, Taiwan. Uchiyama, Y., Odani, S., Kashima, M., Kamidaira, Y. and Mitarai, S. (2019): Interisland coral connectivity across the Nansei Archipelago, the East China Sea: Dynamical influences of the Kuroshio, 20th Pacific Asian Marginal Seas (PAMS 2019), Mar. 19-22, 2019, Kaohsiung, Taiwan. Kimura, W., Masunaga, E., Kosako, T. and Uchiyama, Y. (2019): Lagrange粒子追跡モデルを用いた伊豆諸島周辺海域の物質輸送・拡散の評価, Japan Geoscience Union Meeting 2019 (JpGU 2019), Chiba, Japan, May 26–30, 2019. Kamidaira, Y., Kawamura, H., Kobayashi, T., and Uchiyama, Y. (2019): Implementing regional downscaling capability in the STREAMER ocean prediction system based on multi-nested ROMS model（多段ネストROMSモデルに基づいたSTEAMERにおけるダウンスケーリング機能の実装）, Japan Geoscience Union Meeting 2019 (JpGU 2019), Chiba, Japan, May 26–30, 2019. Nagai, T., Clayton, S. and Uchiyama, Y. (2019): Multiscale routes to supply nutrients through the Kuroshio nutrient stream, Japan Geoscience Union Meeting 2019 (JpGU 2019), Chiba, Japan, May 26–30, 2019. Takaura, N., Uchiyama, Y., Zafarullah, N. and Nakayama, A. (2019): A reanalysis of regional circulations in the Southern South China Sea using a HYCOM-ROMS downscaling ocean model（HYCOM-ROMSモデルを用いた南シナ海南部における海洋流動構造に関する研究）, Japan Geoscience Union Meeting 2019 (JpGU 2019), Chiba, Japan, May 26–30, 2019. Tokunaga, N., Uchiyama, Y., Tsumune, D., Yamada, M., Tateda, Y., Ito, Y., Ishimaru, T., Watanabe, Y., Ikehara, K. and Fukuda, M. (2019): Neasrshore transport of suspended radiocesium In the Fuksima Coast derived from Niida River induced by Typhoon Wipha（新田川河口海域における台風Wilpaによる出水イベントに伴う懸濁態放射性セシウムの沿岸輸送について）, Japan Geoscience Union Meeting 2019 (JpGU 2019), Chiba, Japan, May 26–30, 2019. Uchiyama, Y., Okada, N. and Dong, C. (2019): Fates and dynamical roles of pinch-off mesoscale eddies originated from the Kuroshio Extension Jet（黒潮続流ジェットから放出される切離中規模渦の挙動と力学的効果について）, Japan Geoscience Union Meeting 2019 (JpGU 2019), Chiba, Japan, May 26–30, 2019. Zhang, X., Uchiyama, Y., Suzue, Y. and Yamazaki, H. (2019): Biogeochemical responses to seasonal oceanic variability along the Kuroshio, Japan Geoscience Union Meeting 2019 (JpGU 2019), Chiba, Japan, May 26–30, 2019. Masunaga, E., Kimura, W., Kosako, T. and Uchiyama, Y. (2019): Mass and Heat Transport Generated by the Kuroshio and Tides Investigated with a High Resolution Downscaled Regional Oceanic Model, AOGS 16th Annual Meeting (AOGS 2019), Singapore, Jul. 28 - Aug. 2, 2019. Takaura, N., Uchiyama, Y., Zafarullah, N. and Nakayama, A. (2019): Medium-term water mass exchange and associated regional circulations in the South China Sea, AOGS 16th Annual Meeting (AOGS 2019), Singapore, Jul. 28 - Aug. 2, 2019. Tokunaga, N., Uchiyama, Y., Tsumune, D., Yamada, M., Tateda, Y., Ito, Y., Ishimaru, T., Watanabe, Y., Ikehara, K. and Fukuda, M. (2019): A flood-induced sediment and suspended radiocesium transports in the Fukushima Coast due to Typhoon 201326 analyzed with a JCOPE2-ROMS downscaling model and in situ observations, AOGS 16th Annual Meeting (AOGS 2019), Singapore, Jul. 28 - Aug. 2, 2019. Uchiyama, Y., Okada, N. and Dong, C. (2019): Kuroshio-derived pinch-off mesoscale eddies: Generation, propagation, and recollision with the Kuroshio, AOGS 16th Annual Meeting (AOGS 2019), Singapore, Jul. 28 - Aug. 2, 2019. Zhang, X., Uchiyama, Y., Suzue, Y. and Yamazaki, H. (2019): Biogeochemical responses to seasonal oceanic variability along the Kuroshio, AOGS 16th Annual Meeting (AOGS 2019), Singapore, Jul. 28 - Aug. 2, 2019. Uchiyama, Y., Miyagawa, T., Odani, S. and Mitarai, S. (2018): A Lagrangian analysis on coastal dispersal of larvae and spawn around Okinawa Island, Japan, Proc. 13th International Conference on Hydrodynamics (ICHD2018), pp. 182–188, Incheon, South Korea, Sept. 2-6, 2018. Uchiyama, Y., Sengo, N., Kurosawa, K. and Nakayama, A. (2018): Development of a coupled HYCOM-ROMS downscaling ocean modeling system and its application to the South China Sea, Proc. 13th International Conference on Hydrodynamics (ICHD2018), pp. 358–363, Incheon, South Korea, Sept. 2-6, 2018. Uchiyama, Y. (2018): Surface gravity and capillary waves, Encyclopedia of Ocean Sciences Third Edition, 10 pp., Elsevier, doi:10.1016/B978-0-12-409548-9.11465-4. Miyoshi, T., Kotsuki, S., Terasaki, K., Kondo, K., Lien, G.-Y., Kurosawa, K., Satoh, M., Tomita, H. and Kalnay, E. (2018): Enhancing data assimilation of GPM observations, AMS Annual Meeting 2018, 22nd Conference on Integrated Observing and Assimilation Systems for the Atmosphere, Oceans, and Land Surface, Austin, TX, USA, Jan. 7-11, 2018. Akan, C., McWilliams, J.C., Uchiyama, Y. and Romero, L. (2018): On the Interaction of Eddies and Surface Waves in Southern California, 2018 Ocean Sciences Meeting, Portland, OR, Feb. 11-16, 2018. Kotsuki, S., Kurosawa, K. and Miyoshi, T. (2018): Ensemble Forecast Sensitivity to Observations Verified with Multiple References, 6th International Symposium on Data Assimilation, Munich, Germany, Mar. 5-9, 2018. Uchiyama, Y., Aduma, K., Iwasaki, T., Odani, S., Kamidaira, Y., Tsumune, D., Shimizu, Y. and Onda, Y. (2018): Storm-driven flood and associated coastal dispersal of suspended radiocesium from Niida River: A high-resolution numerical assessment with a coupled river-ocean-wave-sediment model, European Geosciences Union General Assembly 2018 (EGU2018), Vienna, Austria, April 8–13, 2018. Nagai, T., Clayton, S. and Uchiyama, Y. (2018): Multiscale transport, stirring, and mixing processes to supply nutrients through the Kuroshio nutrient stream, Japan Geoscience Union Meeting 2018 (JpGU 2018), Chiba, Japan, May 23, 2018. Masunaga, E., Uchiyama, Y. and Yamazaki, H. (2018): Highly nonlinear internal waves excited by an interaction of tides and the Kuroshio（潮汐と黒潮の干渉によって発生する非線形性内部波）, Japan Geoscience Union Meeting 2018 (JpGU 2018), Chiba, Japan, May 20, 2018. Uchiyama, Y., Suzue, Y. and Yamazaki, H. (2018): Seasonal variability of eddy-induced vertical nutrient flux and associated upper-ocean primary production along the Kuroshio, AOGS 15th Annual Meeting (AOGS 2018), Honolulu, HI, June 3-8, 2018. Cao, Y., Dong, C., Uchiyama, Y., Wang, J. and Yin, X. (2018): Research on the multi-scale spatial and temporal variation of waves in the Southern California Bight, AOGS 15th Annual Meeting (AOGS 2018), Honolulu, HI, June 3-8, 2018. Zhang, X. and Uchiyama, Y. (2018): Impacts of wastewater effluent on a seaweed farm in Osaka Bay in different discharge scenarios, 2nd International Workshop on Regional Ocean Modeling and Observation (ROMO2018), Nanjing University of Information Science and Technology (NUIST), Nanjing, China, July 1-3, 2018. Cao, Y., Dong, C., Uchiyama, Y., Wang, J. and Yin, X. (2018): Multiple-scale variations of wind-wave in the Southern California Bight, 2nd International Workshop on Regional Ocean Modeling and Observation (ROMO2018), Nanjing University of Information Science and Technology (NUIST), Nanjing, China, July 1-3, 2018. Masunaga, E., Uchiyama, Y. and Yamazaki, H. (2018): Nonlinear internal waves and mixing generated by an interaction of background flows and tides, AGU Fall Meeting 2018, Washington D.C., Dec. 10-14, 2018. Okada, N., Uchiyama, Y. and Dong, C.: Analysis on 3D structures of oceanic mesoscale eddies in the North Pacific by using a velocity-based eddy detection algorithm, AGU Fall Meeting 2018, Washington D.C., Dec. 10-14, 2018. Uchiyama, Y., Odani, S., Kashima, M., Kamidaira, Y. and Mitarai, S. (2018): Enhancement of interisland coral connectivity by the Kuroshio across the Nansei Archipelago, the East China Sea, AGU Fall Meeting 2018, Washington D.C., Dec. 10-14, 2018. Zhang, X. and Uchiyama, Y. (2018): Can alternative operations at a sewage treatment plant reduce accumulation of the effluent in an adjacent seaweed farm?, AGU Fall Meeting 2018, Washington D.C., Dec. 10-14, 2018. Zhang, X. and Uchiyama, Y. (2018)：Numerical assessment of sewage effluent on a seaweed farm in the northeastern Seto Inland Sea, Japan，H30年度複雑熱流体工学研究センター学生発表会，神戸大学，2018年7月9日. Zhang, X. and Uchiyama, Y. (2018): Impacts of wastewater effluent on a seaweed farm in Osaka Bay in different discharge scenarios（大阪湾におけるノリ養殖場への処理水の影響とその対策効果）, 平成30年度瀬戸内海研究フォーラム in 兵庫, 神戸大学, 2018年8月30日–31日. 岡田信瑛・内山雄介 (2018): 和歌山県田辺湾における海水交換特性の季節変化とその形成メカニズムに関する研究, 平成30年度瀬戸内海研究フォーラム in 兵庫, 神戸大学, 2018年8月30日–31日. Kurosawa, K., Uchiyama, Y. and Miyoshi, T. (2017): Development of a coastal forecasting system with a 3DVAR assimilation for the Seto Inland Sea, Japan, 19th Pacific-Asian Marginal Seas Meeting (PAMS 2017), Jeju, South Korea, Apr. 11-13, 2017. Okada, N., Uchiyama, Y., Liu, Y. and Dong, C. (2017): On generation and propagation of oceanic mesoscale eddies in the North Pacific analyzed with an eddy-tracking algorithm, 19th Pacific-Asian Marginal Seas Meeting (PAMS 2017), Jeju, South Korea, Apr. 11-13, 2017. Uchiyama, Y., Suzue, Y. and Yamazaki, H. (2017): Meridional transition of upper-ocean primary productivity due to diapycnal eddy mixing across the Kuroshio off Japan, 19th Pacific-Asian Marginal Seas Meeting (PAMS 2017), Jeju, South Korea, Apr. 11-13, 2017. Zhang, X., Uchiyama, Y. and Suzue, Y. (2017): Model assessment of wastewater effluent on a seaweed farm in Osaka Bay, Japan 19th Pacific-Asian Marginal Seas Meeting (PAMS 2017), Jeju, South Korea, Apr. 11-13, 2017. Okachi,H., Yamada, T.J., Watanabe, Y., Saruwatari, A., Ohtsuka, J., Mori, N., Baba, Y., Mizutani, H., Kubo, T., Ninomiya, J. and Uchiyama, Y. (2017): Drop size distribution under severe wind condition in marine observation and wind-tunnel experiment, European Geosciences Union General Assembly 2017 (EGU2017), Vienna, Austria, Apr. 23-28, 2017. Masunaga, E., Suzue, Y., Uchiyama, Y., Yamazaki, H. (2017): Numerical simulations of internal wave dynamics in the vicinity of Izu-Oshima Island, off Sagami Bay, Japan, JpGU-AGU Joint Meeting 2017, Chiba, Japan, May 20-25, 2017. 山田正俊・青山道夫・池原 研・猪股弥生・植松光夫・内山雄介・帰山秀樹・加藤義久・日下部正志・熊本雄一郎・高畑直人・田副博文・張 勁・坪野考樹・津旨大輔・鄭 建・永井尚生・浜島靖典・本多牧生・三角和弘・楊 国勝 (2017)：福島原発由来の放射性核種の環境動態に関する学際的研究（3）海洋における放射性物質の分布状況・要因の把握，第18回環境放射能研究会，筑波市，2017年3月14−16日. 岡田信瑛・内山雄介 (2017)：海洋表層地衡流を用いた eddy tracking による北太平洋における中規模渦の発生伝播特性の解析，平成29年度土木学会関西支部年次学術講演会・講演概要集，大阪工業大学，大阪市，2017年5月27日. Romero, L., Siegel, D.A., McWilliams, J.C., Uchiyama, Y., Jones, C. (2016): Characterizing Stormwater Dispersion and Dilution from Small Coastal Streams, Ocean Sciences Meeting 2016, New Orleans, LA, USA, Feb. 2016. Suzue, Y., Uchiyama, Y. and Yamazaki, H. (2016): Biogeochamical responses to meso- and submesoscale oceanic variability in the Kuroshio region, Ocean Sciences Meeting 2016, New Orleans, LA, USA, Feb. 2016. Tada, H. and Uchiyama, Y (2016): Near-inertial resonance, upper-ocean stirring and impacts on the Kuroshio path due to typhoons in the northwestern Pacific Ocean, Ocean Sciences Meeting 2016, New Orleans, LA, USA, Feb. 2016. Uchiyama, Y., McWilliams, J.C. and Akan, C. (2016): Topographic effects on low-frequency variability in three-dimensional transient littoral currents, Ocean Sciences Meeting 2016, New Orleans, LA, USA, Feb. 2016. Uchiyama, Y., Yamanishi, T., Tsumune, D., Misumi, K. and Onda,Y. (2016): Three-dimensional modeling of oceanic dispersal of land-derived multi-class suspended radionuclides after the Fukushima Dai-ichi accident, European Geosciences Union General Assembly 2016 (EGU2016), Vienna, Austria, April 22, 2016. Kamidaira, Y., Kawamura, H., Kobayashi, T. and Uchiyama, Y. (2016): Surface mixing and dispersion of radioactive tracer due to submesoscale eddies off the northeastern Pacific coast of Japan, AOGS 13th Annual Meeting (AOGS 2016), Beijing, China, Aug. 2, 2016. Kosako, T., Uchiyama, Y. and Mitarai, S. (2016): Seasonal and inter-annual variability of larval dispersal and ambient currents in the Seto Inland Sea, Japan, AOGS 13th Annual Meeting (AOGS 2016), Beijing, China, Aug. 3, 2016. Kurosawa, K., Uchiyama, Y.,Kosako, T. and Tada, H. (2016): Utilizing a regional ocean model for weather routing for optimal vessel navigation, AOGS 13th Annual Meeting (AOGS 2016), Beijing, China, Aug. 3, 2016. Odani, S., Uchiyama, Y., Yamanishi, T., Kamidaira,Y. and Mitarai, S. (2016): Asymmetric oceanic responses around Okinawa Island in the East China Sea, AOGS 13th Annual Meeting (AOGS 2016), Beijing, China, Aug. 2, 2016. Suzue, Y., Uchiyama, Y. and Yamazaki, H. (2016): Influences of meso- and submeso-scale oceanic variability on the primary production in the Kuroshio region off Japan, AOGS 13th Annual Meeting (AOGS 2016), Beijing, China, Aug. 2, 2016. Tada, H. and Uchiyama, Y. (2016): Impacts of typhoons on upper-ocean mixing and the Kuroshio in the northwestern Pacific Ocean, AOGS 13th Annual Meeting (AOGS 2016), Beijing, China, Aug. 2, 2016. Uchiyama, Y., Yoshiki, T.,Tada, H., Baba, Y., Mizutani, H., Kubo, T., Mori, N., Saruwatari, A., Otsuka, J., Ninomiya, J., Watanabe, Y. and Yamada, T. (2016): Upper ocean dynamics and associated water exchange at the entrance of a semi-enclosed bay based on an in-situ ADCP measurement, AOGS 13th Annual Meeting (AOGS 2016), Beijing, China, Aug. 3, 2016. Zhang, X., Uchiyama, Y. and Suzue, Y. (2016): Modeling coastal dispersal of wastewater effluent from multiple sources in the Seto Inland Sea, AOGS 13th Annual Meeting (AOGS 2016), Beijing, China, Aug. 3, 2016. Kurosawa, K. and Uchiyama, Y. (2016): Development of a three-dimensional variational data assimilation system for the Seto Island Sea, Japan, AGU Fall Meeting 2016, San Francisco, CA, USA, Dec. 2016. Odani, S., Uchiyama, Y., Kashima, M., Kamidaira, Y. and Mitarai, S. (2016): Quantifying coastal connectivity of coral spawn and larvae around Ryukyu Islands in the East China Sea, AGU Fall Meeting 2016, San Francisco, CA, USA, Dec. 2016. Uchiyama, Y., Yamanishi, T., Iwasaki, T., Shimizu, Y., Tsumune, D., Misumi, K. and Onda, Y. (2016): Modeling nearshore dispersal of river-derived multi-class suspended sediments and radionuclides during a flood event around the mouth of Niida River, Fukushima, Japan, AGU Fall Meeting 2016, San Francisco, CA, USA, Dec. 2016. Zhang, X., Uchiyama, Y. and Suzue, Y. (2016): Impact of a diversion of sewage effluent on a seaweed farm in the Seto Inland Sea, Japan, AGU Fall Meeting 2016, San Francisco, CA, USA, Dec. 2016. Kosako, T. and Uchiyama, Y. (2015): Larval dispersal in the Seto Inland Sea analyzed with a 3-D Lagrangian particle tracking, Proc. of 34th JSST Annual Conference: International Conference on Simulation Technology, Toyama, Japan, Oct. 12, 2015, pp. 310-313. Suzue, Y. and Uchiyama, Y. (2015): Seasonal variability of Eulerian tracer dispersal in an estuary and a continental shelf margin, Proc. of 34th JSST Annual Conference: International Conference on Simulation Technology, Toyama, Japan, Oct. 12, 2015, pp. 314-317. Uchiyama, Y. and Kawakami, M. (2015): Three-dimensional transient rip currents: Effects of topography on low-frequency motions, Proc. of 34th JSST Annual Conference: International Conference on Simulation Technology, Toyama, Japan, Oct. 12, 2015, pp. 318-320. 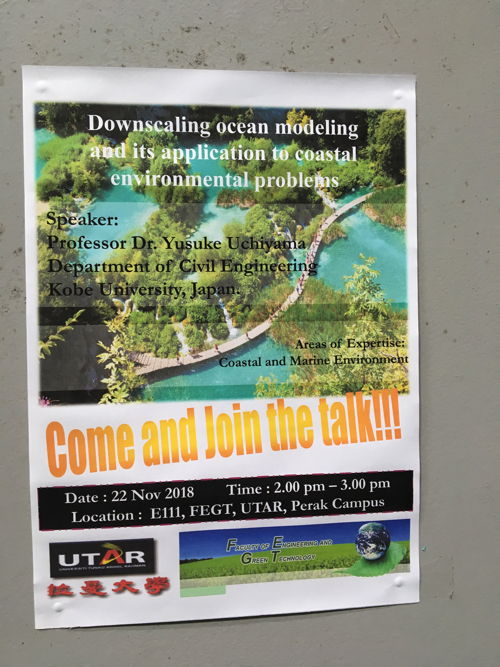 Tada, H. and Uchiyama, Y.: Near-inertial resonance and upper-ocean stirring due to typhoons in the northwestern Pacific margin, The 2nd Open Science Symposium on Western Pacific Ocean Circulation and Climate (2nd OSS-2015), Busan, South Korea, Oct. 2015. Uchiyama, Y., Miyazaki, D. and Kanki, R.: Influences of submesoscale eddies on synoptic and mesoscale dynamics in the Japan Sea, The 2nd Open Science Symposium on Western Pacific Ocean Circulation and Climate (2nd OSS-2015), Busan, South Korea, Oct. 2015. Uchiyama, Y. and Tada, H. (2015): Modeling oceanic responses to typhoons in the northwestern Pacific margin, AOGS 12th Annual Meeting (AOGS 2015), Singapore, Aug. 2015. Romero, L., Uchiyama, Y., Ohlmann, C., McWilliams, J.C. and Siegel, D.A. (2015): Anisotropic Relative Dispersion near the Southern California Coast, Lagrangian Analysis and Prediction of Coastal and Ocean Dynamics (LAPCOD2015), Winter Harbor, MA, USA, July 2015. Yamanishi, T.,Uchiyama, Y.,Onda, Y.,Tsumune, D, and Misumi, K.(2015): Modeling dispersal of land-derived suspended radionuclides in the Fukushima coast, Japan Geoscience Union Meeting 2015, Chiba, Japan, May 2015. Kosako, T., Uchiyama, Y. and Mitarai, S. (2015): Effects of fluctuating Kuroshio path on larval dispersal in the Seto Inland Sea, 18th Pacific-Asian Marginal Seas Meeting (PAMS 2015), Naha, Japan, Apr. 2015. Suzue, Y. and Uchiyama, Y. (2015): Coastal dispersal of Eulerian passive tracer: Comparative experiments in an estuary and a continental shelf margin, 18th Pacific-Asian Marginal Seas Meeting (PAMS 2015), Naha, Japan, Apr. 2015. Tada, H. and Uchiyama, Y. (2015): Oceanic and coastal responses to super typhoons in the northwestern Pacific marginal seas, 18th Pacific-Asian Marginal Seas Meeting (PAMS 2015), Naha, Japan, Apr. 2015. Uchiyama, Y. and Kamidaira, Y. (2015): Topographic effects on submesoscale eddy mixing around the Kuroshio off the Ryukyu Islands, 18th Pacific-Asian Marginal Seas Meeting (PAMS 2015), Naha, Japan, Apr. 2015. Uchiyama, Y., Kanki, R. and Nakayama, A. (2014): Coastal dispersal of urban treated wastewater in semi-enclosed estuaries, Proc. 24th International Ocean and Polar Engineering Conference, Busan, Korea, 4p. Kamidaira, Y., Uchiyama, Y., Mitarai, S. and Sakagami, T. (2014): Effects of the submesoscale anticyclonic eddies induced by Kuroshio in East China Sea, Proc. 24th International Ocean and Polar Engineering Conference, Busan, Korea, 5p. Phan, T.N.M., Wells, J.C., Uchiyama, Y., Ishii, S., Bonner, J.S., Islam, M.S. and Kirkey, W.D. (2014): Principal component analysis on horizontal acoustic Doppler current profilers measurement in a tidal river, J. Japan Soc. Civil Eng., Ser. B1 (Hydraulic Engineering), Vol. 70, No. 4, pp. I_73-I_78. Marchesiello, P., Benshila, R., Almar, R., Uchiyama, Y., McWilliams, J. and Shchepetkin, A. (2014): On tridimensional rip current modeling, Proc. 19th IAHR-APD Congress 2014, Hanoi, Vietnam, 7p. 甲斐田秀樹・内山雄介（2014）：波−流れ相互作用が海浜流系の力学構造に及ぼす影響について，土木学会論文集B2（海岸工学）, Vol. 70, No.1, pp.1-14. 内山雄介・松川大佑・神吉亮佑・馬場康之・森 信人・水谷英朗・渡部靖憲・大塚淳一・山田朋人・猿渡亜由未・二宮順一	（2014）：紀伊半島田辺湾湾口部における海水交換特性に関する研究，土木学会論文集B2（海岸工学），Vol.70, No.2, pp. I_446-I_450. 内山雄介・宮崎 大・神吉亮佑・宮澤泰正（2014）：日本海全域を対象としたダウンスケーリング海洋モデルによる広域海況評価，土木学会論文集B2（海岸工学），Vol.70, No.2, pp. I_451-I_455. 馬場康之・水谷英朗・久保輝広・内山雄介・森 信人・渡部靖憲・大塚淳一・山田朋人・猿渡亜由未・二宮順一（2014）：台風通過に伴う田辺湾湾口部における海水温変化について，土木学会論文集B2（海岸工学），Vol.70, No.2, pp. I_476-I_480. Kaida, H., Uchiyama, Y. and McWilliams, J.C. (2014): Wave-current interaction in the surfzone-inner shelf circulations, Ocean Sciences Meeting 2014, Honolulu, HI, USA. Nishii, T., Uchiyama, Y., Mori, N. and Baba, Y. (2014): Cooling the upper ocean around Seto Inland Sea due to typhoons, Ocean Sciences Meeting 2014, Honolulu, HI, USA. Kumar, N., Feddersen, F., Uchiyama, Y., McWilliams, J. and O'Reilly, W. (2014): Model-Data Comparison of Surfzone and Inner-Shelf Circulation during HB06, Ocean Sciences Meeting 2014, Honolulu, HI, USA. Romero, L., Uchiyama, Y., Ohlmann, J.C., McWilliams, J.C. and Siegel, D.A. (2014): Nearshore anisotropic relative dispersion in Southern California, Ocean Sciences Meeting 2014, Honolulu, HI, USA. Uchiyama, Y. and Nishii, T. (2014): Cold water formation in response to typhoon passages in and around Seto Inland Sea, Japan, AOGS 11th Annual Meeting (AOGS 2014), Sapporo, Japan. Kaida, H., Uchiyama, Y. and McWilliams, J.C. (2014): Effects of wave-current interaction on the inner-shelf eddying flows, AOGS 11th Annual Meeting (AOGS 2014), Sapporo, Japan. Kamidaira, Y., Uchiyama, Y., Mitarai, S. and Miyazawa, Y. (2014): Topographic effects of Ryukyu Islands on the enhancement of submesoscale anticyclonic eddies on the eastern side of Kuroshio in East China Sea, AOGS 11th Annual Meeting (AOGS 2014), Sapporo, Japan. Miyazaki, D., Uchiyama, Y., Kanki, R. and Miyazawa, Y. (2014): A retrospective high-resolution numerical experiment of Japan Sea with a JCOPE2-ROMS downscaling system, AOGS 11th Annual Meeting (AOGS 2014), Sapporo, Japan. Yamanishi, T., Uchiyama, Y., Tsumune, D. and Miyazawa, Y. (2014): Development of a regional sediment transport model for dispersal of land-derived radionuclides in the ocean, AOGS 11th Annual Meeting (AOGS 2014), Sapporo, Japan. Kosako, T., Uchiyama, Y., Mitarai, S. and Nishii, T. (2014): Stochastic analysis with coastal connectivity on larval networks in the Seto Inland Sea, AOGS 11th Annual Meeting (AOGS 2014), Sapporo, Japan. Masumoto, Y., Guo, X., Hirose, N., Ikeda, Mitsudera, H., Miyazawa, Y., Tsumune, D. and Uchiyama, Y. (2014): Experimental development of ocean prediction system for accidental radionuclide dispersion, AOGS 11th Annual Meeting (AOGS 2014), Sapporo, Japan. Romero, L., Uchiyama, Y., Siegel, D.A. and McWilliams, J.C. (2014): Inner Shelf Dispersion and Dilution of Creek Runoff, 61st Annual Eastern Pacific Ocean Conference (EPOC 2014), Sept. 2014, Mt. Hood, OR, USA. Uchiyama, Y., Miyazaki, D. and Kaida, H. (2014): Wave-current interaction in evolution of rip channel system, AGU Fall Meeting 2014, San Francisco, CA, USA, Dec. 2014. Kamidaira, Y., Uchiyama, Y., Mitarai, S. and Miyazawa, Y. (2014): Enhancement of eddy heat transport due to the anticyclonic submesoscale eddies around Ryukyu Islands near Kuroshio in East China Sea, AGU Fall Meeting 2014, San Francisco, CA, USA, Dec. 2014. Kosako, T., Uchiyama, Y., and Mitarai, S. (2014): Modeling larval dispersal and quantifying coastal connectivity based on a downscaling ocean model in Seto Inland Sea, Japan, AGU Fall Meeting 2014, San Francisco, CA, USA, Dec. 2014. Miyazaki, D., Uchiyama, Y., Kanki, R. and Miyazawa, Y. (2014): Impact of submesoscale eddies on synoptic and mesoscale oceanic structures in a continental shelf margin analyzed with a downscaling ocean model of Japan Sea, AGU Fall Meeting 2014, San Francisco, CA, USA, Dec. 2014. Yamanishi, T., Uchiyama, Y., Tsumune, D. and Miyazawa, Y. (2014): A regional sediment transport modeling for assessing dispersal and recirculation of land-derived radionuclides in the Fukushima coast, AGU Fall Meeting 2014, San Francisco, CA, USA, Dec. 2014. Romero, L., Uchiyama, Y., Ohlmann, C., McWilliams, J.C. and Siegel, D.A. (2013): Particle-pair dispersion in the Southern California coastal zone, J. Phys. Oceanogr., Vol. 43, pp.1862–1879. Uchiyama, Y., Kaida, H. and Miyazaki, D. (2013): Wave-current interaction in formation of rip channel system, Proc. 7th International Conference on Asian and Pacific Coasts (APAC 2013), pp. 173-179, Bali, Indonesia. Baba, Y., Kubo, T., Uchiyama, Y., Kihara, N., Mori, N., Muto, Y. and Suzuki, T. (2013): Field observations at an offshore observation tower during the typhoon seasons, 35th IAHR World Congress, Chengdu, China. Mitarai, S., Uchiyama, Y., Sakagami, T., Molemaker, M.J., Siegel, D.A. and McWilliams, J.C. (2013): Typhoons alter dispersal patterns in the Kuroshio Current system, ASLO Aquatic Sciences Meeting 2013, New Orleans, LA, USA. Uchiyama, Y., Yamanishi, T., Tsumune, D. and Miyazawa, Y. (2013): Initial oceanic dispersion mechanism of radionuclides released from Fukushima, Japan Geoscience Union Meeting 2013, Chiba, Japan. Romero, L., Uchiyama, Y., Ohlmann, C., McWilliams, J.C. and Siegel, D.A. (2013): Simulations of Nearshore Particle-Pair Dispersion in Southern California, The Eastern Pacific Ocean Conference (EPOC 2013) , Fallen Leaf Lake, CA, USA. Kaida, H. and Uchiyama, Y. (2013): Surfzone-inner shelf interaction analyzed with a quintuple nested high resolution ocean model, 32nd Int'l Conf. on Simulation Technology (JSST2013), Extended Abstracts, 2p. (USB), Tokyo, Japan. Kamidaira, Y., Uchiyama, Y., Mitarai, S. and Sakagami, T. (2013): A numerical study of effects of submesoscale anticyclonic eddies induced by Kuroshio around Ryukyu Islands, 32nd Int'l Conf. on Simulation Technology (JSST2013), Extended Abstracts, 2p. (USB), Tokyo, Japan. Miyazaki, D., Uchiyama, Y. and Kaida, H. (2013): Wave-current interaction in morphological change on a barred beach, 32nd Int'l Conf. on Simulation Technology (JSST2013), Extended Abstracts, 2p. (USB), Tokyo, Japan. Kanki, R., Uchiyama, Y. and Nakayama, A. (2013): Wastewater dispersal in Osaka Bay and Harima Nada using a multi-nested high-resolution ocean modeling, 32nd Int'l Conf. on Simulation Technology (JSST2013), Extended Abstracts, 2p. (USB), Tokyo, Japan. Phan, T.N.M., Wells, J.C., Uchiyama, Y., Bonner, J.S., Islam, M.S. and Kirkey, W.D. (2013): Principal component analysis on horizontal acoustic Doppler current profilers measurement, Oceans 2013 MTS/IEEE, San Diego, CA, USA. 内山雄介・西井達也・J.C. McWilliams（2012）：VF型位相平均Primitive方程式を用いた沿岸海洋流動に及ぼす波浪の影響に関する研究，土木学会論文集B2（海岸工学），Vol.68, No. 2, p. I_426-I_430. 内山雄介・石井翔大・宮澤泰正（2012）：JCOPE2-ROMS多段ネスティングによる黒潮続流域でのダウンスケーリング効果の検証，土木学会論文集B2（海岸工学），Vol.68, No. 2, p. I_436-I_440. 内山雄介・栗山貴生・宮澤泰正（2012）：外洋影響を考慮した瀬戸内海周辺海域の流動再現と黒潮流路変動の効果について，土木学会論文集B2（海岸工学），Vol.68, No. 2, p. I_441-I_445. Phan, T.M., Uchiyama, Y., Bonner, J., Ojo, T., Wells, J., Fuller, C., Islam, M., Kirkey, W., Ishii, S. and Nishii, T. (2012): Highly-resolved computations in the Hudson River Estuary, Ocean Sciences Meeting, Salt Lake City, UT, USA. (OS official). Uchiyama, Y. and McWilliams, J.C. (2012): Three-dimensional unsteady wave-driven littoral currents, 4th International Workshop on Modeling the Ocean (IWMO-2012), Yokohama, Japan. Ishii, T., Uchiyama, Y., Tsumune, D. and Miyazawa, Y. (2012): Oceanic dispersion of cesium-137 off the north-eastern Pacific coast of Japan, 4th International Workshop on Modeling the Ocean (IWMO-2012), Yokohama, Japan. Kaida, H. and Uchiyama, Y. (2012): Effects of wave-current interaction on development of rip currents, 4th International Workshop on Modeling the Ocean (IWMO-2012), Yokohama, Japan. Nishii, T., Uchiyama, Y. and McWilliams, J.C. (2012): Oceanic responses to surface gravity waves in the Southern California Bight, 4th International Workshop on Modeling the Ocean (IWMO-2012), Yokohama, Japan. Wells, J.C., Phan, T.N.M., Nguyen, L.V., Susuki, Y., Kirkey, W.D., Islam, M.S., Fuller, C.B., Bonner, J.S. and Uchiyama, Y. (2012): A method to characterize the spatial structure of superdepth-scale near-bank vortices, with a view to operational monitoring, 1st International Conference on Frontiers in Computational Physics: Modeling the Earth System, Boulder, CO, USA. Uchiyama, Y., Ishii, T., Tsumune, D. and Miyazawa, Y. (2012): Coastal dispersal of radionuclides released from the Fukushima Nuclear Power Plant, AGU Fall Meeting 2012, San Francisco, CA, USA. Ishii, S., Uchiyama, Y. and Miyazawa, Y. (2012): Submesoscale Frontal Dynamics in the Kuroshio Extension Jet, AGU Fall Meeting 2012, San Francisco, CA, USA. Kuriyama, T., Uchiyama, Y. and Miyazawa, Y. (2012): Impact of the Kurishio paths on oceanic and estuarine circulations in and around Seto Inland Sea, Japan, AGU Fall Meeting 2012, San Francisco, CA, USA. Powered by PHP 5.5.29. HTML convert time: 0.174 sec.